Issues and topics related to being a webmaster or web developer. You must watch the following video from Ted Talks. It is incredibly informative and humorous. When dealing with your sales funnel, it will make you realize that you can caress a visitor in a particular (and more profitable) direction by simply making an offer appear more attractive with the inclusion of a less attractive version of the same. Watch the video to understand completely. There is a lot of chatter about Apples’s WWDC on 6/7/2010-6/11/2010. Most in the tech crowd feel that there won’t be much new news announced. An iPhone 4G was lost/leaked/stolen, etc. and a 2nd version turned up overseas giving us a little more insight into the case (perhaps). My take on the backing of the VisualStudio platform has a lot to do with the battle with Adobe. Apple and Adobe aren’t exactly getting along. Steve Jobs has gone out of his way to disparage Flash and Adobe and even went so far as to call them ‘lazy’ for not working to improve Flash. For those who don’t know, it is a resource hog. By enlisting Microsoft to work on tools to develop for Apple’s platforms they are needling the current leader in the development space. Adobe owns a couple of markets right now and one way to put another dagger in their heart (or back) would be to push into their market. The fact that Apple would consider doing this with Microsoft is a surprise. Imagine if Microsoft is able to move Visual Studio (or some variation of) toward becoming a product that web developers would consider in lieu of Adobe’s Creative Suite (Dreamweaver). That would put them back on their heels a bit more. As a developer, I would have to look long and hard (and probably wouldn’t waste the time to do so) after Microsoft’s past attempts to build tools for the web space. Microsoft’s Frontpage was an early leader in this area and lost the game due to the horrific code output and some of the non-standards compliant touches that Microsoft allowed in the product. In the end, there is a chance that Apple is simply using Microsoft to tighten the screws on Adobe. After all, the cultures at Adobe and Apple are much closer than those at Apple and Microsoft. Apple’s WWDC could be a big event, or it could simply be another one of their events that make you say “That is about what we thought they would come out with…”. As always, time will tell! Posted on May 27, 2010 Categories Webmaster GeneralTags aapl, adbe, adobe, apple, dreamweaver, frontpage, microsoft, msft, visual studio, wwdcLeave a comment on What’s up Apples Sleeve at WWDC. More pain for Adobe? 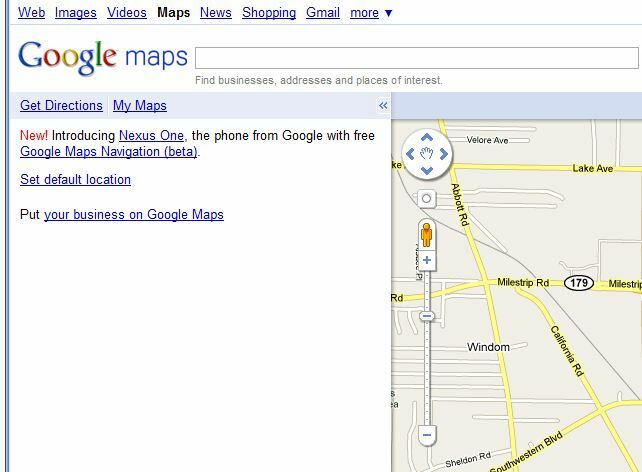 I know that Google wants to get the Nexus one out to the masses, but this surprised me. 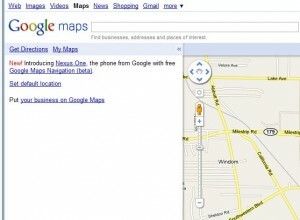 They are pitching the Nexus one from within a map search in my browser. Nothing wrong with using your real estate wisely, but this is a bit aggressive for Google. It isn’t often that you see Google pitch a product as much as they are with the Nexus One. In fact they are using home page ad space that they don’t often touch. In fact, Eric Schmidt believes they are giving up billions by not doing so. I wonder if he had to twist Marissa Mayer’s arm to push the Nexus One on the home page and in the slots within other Google products. Think we will see a pitch within Adsense or Adwords soon? If you don’t already know it, an 800 number is not an expensive proposition. I have used a site for a few years that costs $2 per month for a standard 888, 877, or 866 number plus usage rates of 6.9 cents per minute. An 800 number increases your base rate to $5 per month. There are also vanity phone numbers available. You can also use a service such as RingCentral.com to manage multiple numbers including fax lines and employee extensions. Ring Central is a better choice if you plan on a decent volume of calls or plan to add numbers for additional employees or services. Kall8 is a good choice if you don’t anticipate much activity, but have a need for a number at a very low cost. If you are a company who is trying to project a presence beyond your local area, an 800 number is good idea. It isn’t always the cost to your consumer, it is really the perception that you are a larger company. If you need to project a different story to a consumer, well, you can do that too. Are you located in Orlando, but want the customer to assume that you are in Chicago? I said assume. You can obtain a local number much the way you would an 800 number. This might be the item that pushes your consumer to purchase something from you rather than from a competitor. If you have a customer who wants an item fast, and you can provide that, he or she might have the impression that it takes longer for the item to reach them from Florida rather than Illinois. Along with an inexpensive toll free number, or local number, you could consider a Virtual Office. With a virtual office, you can project an image that will win you customers simply due to the image that you project. I am not suggesting that you are dishonest with anyone. If asked, make it clear that your business address is a shared executive office facility and that you are not there on a daily basis. As a growing company, it is not a surprise to move once or twice in the first year or two. A virtual office address will not only provide a better image than using your home address, or a foreign address, but it will allow you to keep a single address during your growth phase. This will save you some time and money in updating letterhead, business cards, web sites, directory site listings, map listings, local business listings, and more (in the event that you move your physical location). Consider a virtual office with a local number. It can help your business to grow. If you are part of an online business that gains any traction, you will likely face legal issues that have never encountered before. It could be a situation where you are on the receiving end, or it could be a situation where you have to expend funds to protect your business or your brand. Here is a situation where a company might be hitting a little too close to home by basing their logo on another well known logo. The company who is pushing the boundary a bit is in the social networking business and probably competes with Yahoo in a number of areas. Take a look at the logos below. You be the judge. In my opinion, the spirit of the logo was definitely taken from the Yahoo logo. This could have been a subconscious choice by the designer, or a decision made without care. The fact that they compete in a number of areas makes this a touchy one that is likely to raise concern in the legal department at Yahoo. If you are building a brand online, be unique. Copying a leader will likely generate some legal costs and a change in your logo in the near future. Not good for your brand identity. If you have been working as an online marketer for any period of time, you have probably heard of Jeremy Shoemaker (Shoemoney). Shoemeney is offering a free, 12 week, Internet marketing course that should rival many of the paid courses and e-books that are promoted like mad. Google jumped into the radio ad market with a small amount of fanfare back in 2006. If you were someone who gave their radio ads a shot, I would bet that you might have had the same experience. Terrible audience. Well, the radio ad experiment is shutting down. Radio advertising is like real estate. Location, location, location. If you aren’t tapping into the heart of a market, you aren’t going to provide a good product to the end user. In my market (Buffalo NY) the station mix was very poor. Fringe stations to say the least. Some test campaigns were virtually useless. Advertisers can continue using Google Audio Ads until May 31st. Google is getting back to its roots and focusing on what comes from that. They are retreating certain fronts (selling radio ads and selling newspaper ads) and continuing to build on search and Adwords and the audience that it brings. They need to focus on their core for the coming battle in the OS/desktop space. This expires on 1/31/2009. Use it while you can. Why, Oh Why is Microsoft Buying Yahoo? I wrote an article in May of this past year about the rumored purchase of Yahoo (YHOO) by Microsoft (MSFT). Well, it looks like it is happening. The article is as pertinent today as it was nearly nine months ago. In fact, the landscape has change even further. Here is what I wrote in May of 2007. 4 05 2007 The rumors are flyingâ€¦ Again. If you follow the market, or the search space, you have heard this one before. I own shares in YHOO and because of that, I think that it is a great idea. On the business side? I am not inspired. I donâ€™t think that consolidation is needed in this space. At least not at this level. I am still a big fan of Yahoo Search Marketing (formerly Overture). For people doing SEM and PPC (one in the same in most views) MSN coming along was something that was cheered by most. Finally another player who is significant enough to gain distribution and allow us another market to compete in. Well, it didnâ€™t exactly turn out that way. When MSN Adcenter was finally live, I was very excited. With the reach of MSN through the various properties, I felt certain that they could challenge Yahoo for the number 2 spot in the PPC world. Not the case. In fact, it has been rather disappointing. You can achieve some nice results with Adcenter advertising, but the scale just isnâ€™t there. Well, what does Microsoft do? What does Yahoo do? Does a marriage make sense? For shareholders in Yahoo (YHOO) this does make sense. For usersâ€¦ we shall see. I picture a post acquisition Yahoo with many of their parts being shut down. What I think of most when I think of this possible combination is â€œwhat a free email behemoth this isï¿½?. Obviously many things have changed since then. The reasons for the acquisition are likely different than they were last year. Last year it was all about Pay Per Click (PPC) and gaining back some of the pie that Google has in the online advertising arena. Of course, this was prior to the level of challenge that MSFT is facing against its cash cow products, the Windows operating system (OS) and their Office Suite. Facebook wants to become a ‘platform’ rather than just a social networking web site; many others have followed that lead. Sun appears to be gaining traction with Open Office. Google Docs are picking up steam and will soon be ready for use offline via Google gears. Yahoo offers up some interesting technology and a massive user base. The cost for the acquisition probably made the deal that wasn’t right last year a much better one this year. Take an example that might resonate with you. You looked at a house last year in Souther California. It was priced at $700k and mortgage rates were 6.25%. Well, the market has cooled and interest rates are down. The house is now at $525k and the mortgage rates are around 5%. Wouldn’t you be tempted? Prices are down and money is cheap… Isn’t that the time to be a buyer? This is an example of Microsoft saying the game is on Google (goog), Sun (java), Facebook, etc. Those three might retort “um…. we have been playing hard for a while now, where have you been”. In making that argument you have to look back at what Microsoft did when it threw down the gauntlet in the browser wars. Bye-Bye Netscape. If they can have the same kind of success by utilizing their monopoly in operating systems leveraging their user base, then the balance could shift. I just don’t see that happening. It is like trying to turn around a ship in the water. Posted on February 1, 2008 Categories Webmaster GeneralLeave a comment on Why, Oh Why is Microsoft Buying Yahoo? Having been in the search marketing and web development business for the past 10 years, I assume a numbr of things. One of them is that anyone running an e-commerce business has an understanding of where their pay-per-click ads (PPC) will display. Many merchants aren’t aware of the reach that can be achieved with a campaign at Yahoo Search Marketing or Google Adwords. I came across a search engine comparison chart at Mikes Marketing that provides a simple layout of the relationships between the major search engines and what powers the paid listings, search results and the directory. Take a look at Mike’s Search Engine Chart. For something more interactive, you can always take a look at the Search engine relationship chart at Bruce Clay. BruceClay.com has been a leader in search marketing for many years. They have a nice toolset for any webmaster and also offer top notch paid tools. From their chart, they provide links to details regarding each search engine and provide submission URL’s for each. It can be a good idea to see what other sites are doing to reach their audience and obtain top rankings. A focus on the internal (on site) methods that Bruce Clay is using should give you some insights on areas where you site might be lacking. They have always been a white hat shop and have always been at the top of the game.